I was fortunate enough to recieve the T6 tech avalanche shovel - snow saw from Voile-USA for review on Highball Blog. So after testing it, my statement is that Voile-USA's T6 Tech series avalanche shovels are the best choice for back country skiers, mountaineers and snowmobile fans. I was highly impressed as soon as I took it out of the box, so light weight. It's also by far the best looking shovel I've seen. The T6 tech conveniently stows a 14"/36 cm snow saw blade inside the handle. 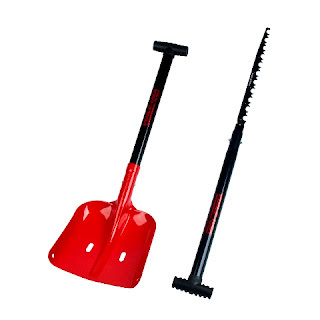 You can easily attach the snow saw blade to the end of the shovel shaft for snow science work and winter shelter building. Want an igloo and the shovel is not enough to carve out ice blocks? There's a saw for that! The aluminum scoop has deadman holes for use as a snow anchor or making a rescue sled and has a chip proof coating. I took this shovel with me on a mountain trip recently and it fits perfectly in my 37 liter winter pack without much effort. And at a little over a pound, you can't tell its there. On the first day of the trip a small storm came through so we dug a snow cave in record time. The blade shovel cuts through ice and snow like butter. If you need to pitch your tent on the snow, the shovel is the tool to have - either dig out the snow and build your tent on the ground or you can press the snow and build a wind protection wall around the tent. You don't want that blizzard spoiling your sleep. Also, if you wanna make a fire you can dig a proper fireplace in the snow, down to the ground - this way the heat of the fire won't be lost as it would when you build the fire right on the snow. The T6 tech is the perfect packable avalanche shovel, and I give it 5 stars out of 5. I can see why Voile T6 is the professionals' choice. And being a shovel, it's very versatile - you can use it to get your car out of the snow if you're stuck; you can dig a small well when you need to gather fresh water, etc. 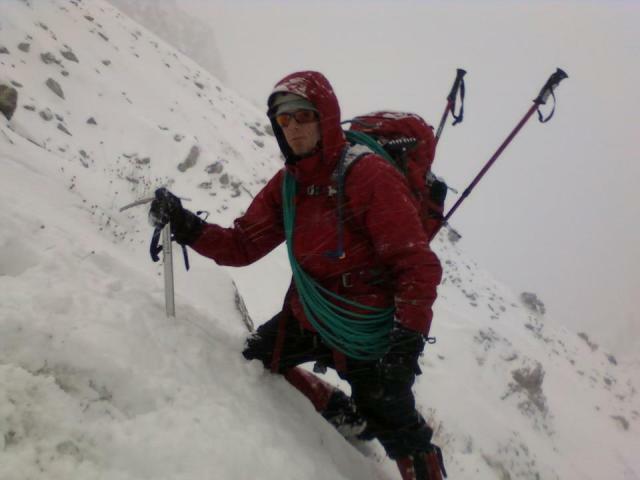 About the author: Aaron Lawrence is a climber and mountaineer from California who tests gear sent by sponsors. When he's not climbing, he writes reviews for Highball Blog.